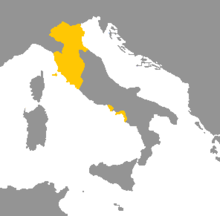 The Etruscan leid (/ᵻˈtrʌskən/) wis the spoken an written leid o the Etruscan ceevilisation, in Italy, in the auncient region o Etrurie (modren Tuscany plus wastren Umbrie an northren Latium) an in pairts o Lombardy, Veneto, an Emilia-Romagna (whaur the Etruscans war displaced bi Gauls). ↑ Nordhoff, Sebastian; Hammarström, Harald; Forkel, Robert; Haspelmath, Martin, eds. (2013). "Etruscan". Glottolog. Leipzig: Max Planck Institute for Evolutionary Anthropology. This page wis last eeditit on 11 September 2015, at 00:36.